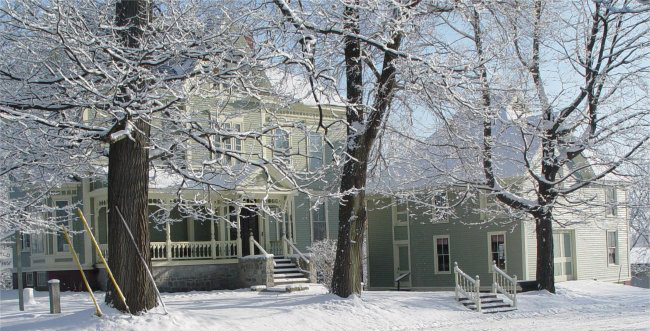 The Fairfield Historical Society is a nonprofit Section 501c (3) which owns and runs and the Fairfield History House. The Society acts as a repository for the history of the Fairfield area and the museum is setup to reflect life in the Victorian period. The Fairfield Historical Society opened for the year on March 6. Out of town researchers were our primary visitors during the unusually hot and humid summer. Our first event of 2018 was hosting 2 Lawrence High School American History Classes. Doug Cutchin gave an introduction about the history of the House and students toured the house and barn. On June 9thand 10thour bi-annual quilt show was held at the Victor Grange. This was a new venue and allowed the Grange to also have a display and encourage new members. Over 50 antique and new quilts from our collection and area quilters were on display. On July 9, the Central Maine Heritage Council, of which we are a member, held a public program at the Victor Grange on Holman Day, writer, author, and movie producer. The speaker was our own Mark McPheters. The program was the kick-off to each museum's events on Maine writers. The FHS displayed our collection of books from local authors. In the fall the Unity College Interpretive Methods Class came for their annual tour of the history house and barn to learn about running a small museum. The annual Barn/Bake Sale was held Oct. 6 & 7 and raised over $1,900.00 to help with operating expenses. Our final event of the year was the Christmas Open House held Dec 2 & 3. The theme was "Attic Treasures" which featured the items from our collections which are not normally on display such as non-Victorian clothing, local veteran and LHS memorabilia, Benton display. The VFW donated poppies for the veteran's tree in the entry. The open house and a quilt raffle raised additional monies towards the house expenses. During 2018, the society engaged G&M Painting of Fairfield to replace damaged clapboards and paint the barn. We also received a donation from Board members to reattach 5 architectural plaques located on the south gable of the house. Another deeply appreciated donation is the free snow removal service that Jeremy Gordon is providing the society. The society also purchased 5 storm windows and lexan coverings to protect the stained glass windows. All volunteer work for the following was done by Bill Blair, Mark McPheters and Doug Cutchin: below grade windows were rebuilt with masonry, lawn work and walkway snow removal. Thank you to the Town of Fairfield and everyone who supported our work this year. A huge thank you to the volunteers and members who set up, decorate and maintain the house and its collections. Their work was viewed by over 300 people and many queries were answered by e-mail. Again this year, we received many donated items for our collection. Among them were two different sets of Civil War letters, some from Donald and Donna Tozier and others from Diana Wolfgang Bess; a Gertrude Smith Victorian chair from Tim Giroux; Coin Spoons handed down in the Donald Brown family from his estate; a Hathaway material quilt from Patricia & Roland Binette; Ed Lord's 1856 Fairfield Tax list; Mark Follansbee's and Melody Morina's late 1800's bike and snow plowing from Jeremy Gordon . Thank you to everyone who supported our work this year. We are seeking new members and volunteers to help with the ongoing work of collecting and preserving the history of Fairfield as well as maintaining the house, barn and grounds. Please consider volunteering a few hours of your time to further our mission to convey Fairfield's rich history to our citizens and those interested in Fairfield. Also, a reminder that your 2019 dues are due April 1. See enclosed form for amounts and indicate the year you are paying for.